Two weekends ago, Lexi and I went to TNNA. That's the yarn conference and trade show for people "in the business" - mostly yarn shops and people who want to sell their stuff to yarn shops. It was amazing and delightful and we picked out some special and marvelous things that we hope to introduce to the store in the coming months. We saw YARN CELEBRITIES, like Cookie A. and the Ravelry Crew (I think I have a crush on Casey). We touched lots of amazing fiber. And walked OVER THREE MILES back and forth across the trade show floor. And coveted and coveted and COVETED. We spent several hours hanging out with the new owner of O-Wool and her mother. I must say, we are SO EXCITED about O-Wool's' new ownership. She's young and hip and positively delightful - I wish we lived on the same coast so that I could be her best friend and we could go to knitnight together. 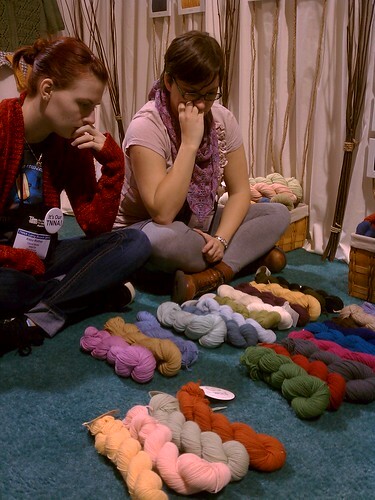 Lexi and I spent a long time in her booth picking out some delightful new colours. These are tough decisions to make!